There are many extrinsic factors that are harmful to the skin. The most well-known are UVB and UVA radiation. Other factors include ground-level ozone, air pollution and smoke. What is less known is that Visible light (VL) and Infrared radiation (IR) are also harmful to the skin. Recent studies have shown that Visible light can cause increased skin darkening in people with pigmented skin. Similarly, Infrared radiation can also cause redness of the skin as well as pigment darkening. As Dermatologists, we have seen this many times while examining our patients – patches of hyperpigmentation on the skin where a patient has applied a hot water bottle for a prolonged period of time. This is called erythema ab igne. Solar radiation is a wide spectrum of electromagnetic radiation issued by the sun. Within this spectrum, there are 4 main radiation types that each affect the skin differently. Short wavelengths that only reach the superficial layer of the skin (epidermis). Responsible for sunburn which causes redness and inflammation (erythema). Has carcinogenic potential due to altered DNA in the cells (increases the risk of cutaneous cancer). Beneficial in producing Vitamin D in the skin. Longer wavelengths that reach into the deeper layers of the skin (dermis). Causes DNA damage (which contributes directly to the development of skin cancer). Chronic exposure causes dermal matrix damage and solar elastosis (photo-ageing). Visible light is any kind of light visible to the human eye. Includes indoor lighting, TVs, computer, tablet and cellphone screens. High energy visible light (HEVL) falls within this spectrum. Impairs the lipid barrier of the skin. Longer wavelengths that penetrate deeper than UVB and UVA. Mainly affects collagen fibres (contributing to the appearance of wrinkles and cutaneous sagging). Causes skin darkening in darker skin types. Generated by heat-emitting devices like hairdryers, heaters, ovens, saunas, hot water bottles etc. Depletes the skin’s natural antioxidants and causes accelerated ageing. Normal UV filters do not protect against Infrared radiation (this is where the antioxidants come in). So, what can we do about the all these external, harmful factors to the skin? Use a high factor, broad-spectrum sunscreen that covers UVB and UVA. Use a sunscreen that incorporates a Visible light blocker – this would include optically opaque filters such as non-micronised forms of zinc oxide, titanium dioxide and iron oxide. These compounds scatter and reflect Visible light. It is especially important to use a VL blocker if you have a darker skin and are prone towards pigmentation. Although the skin does have an endogenous antioxidant capacity to deal with UV-induced oxidative stress, chronic exposure to environmental aggressors can deplete this body’s natural supply and that is why it is so important to either use a sunscreen which contains an antioxidant or to apply an antioxidant serum to the skin before applying a sunscreen. Incorporating antioxidants into your daily skin care routine will help to protect the skin against the harmful effects of atmospheric pollution. It is especially important to use antioxidant protection against Infrared radiation, which penetrates the deepest into the skin. Chemical and physical filters do not provide any protection against IR. Some of the best antioxidants include Vitamin C, Vitamin E, Resveratrol, Ferulic Acid, Phloretin, Pycnogenol® and Fernblock®. 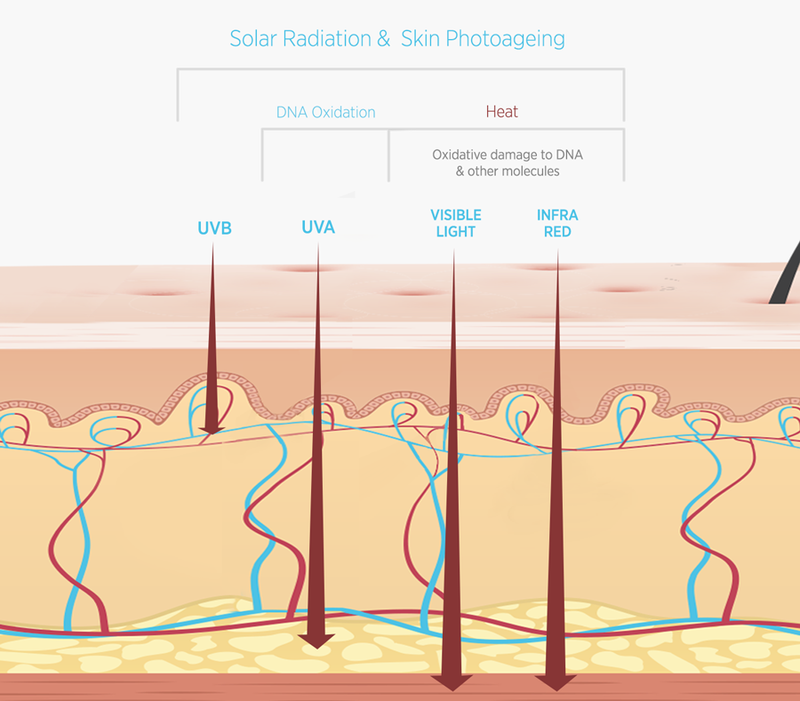 A lifetime of chronic exposure especially to UVB and UVA radiation from the sun eventually damages the DNA in the keratinocytes, in the epidermis of the skin. This can further lead to pre-cancerous lesions called Actinic Keratosis which in turn can lead to full-blown skin cancer. Ideally, you should use a sunscreen that prevents further damage from UVB, UVA, Visible light and Infrared radiation, but one that can also repair DNA damage. We do in fact have such sunscreens that contain DNA repair enzymes: Roxisomes, Photolyase and most recently, GenoRepair Complex which contains 3 DNA repair enzymes – these are found in the new the Heliocare 360° MD AK Fluid 100+ and Heliocare 360° Capsules they are able to prevent, repair and eliminate DNA damage. Oral supplementation such as Fernblock®, which contains the unique and potent Polypodium leucotomos fern extract originating in South America, further enhances photoprotection and has been shown to have superior antioxidant and immunological protection. It is a potent antioxidant and the newly launched Heliocare 360º capsules contain Fernblock+ which are also able to help prevent and repair damage to the DNA in the epidermal keratinocytes. Recent studies have also shown that by taking Fernblock® orally, it helps in the management of melasma and other facial pigmentation. Those at risk of pigmentation should take oral capsules together with an antioxidant and a sunscreen. Please note: oral capsules alone will not provide enough protection. Therefore, in summary, if you want the very best protection for your skin you will need a sunscreen that has a UVB, UVA and Visible light blockers, antioxidants for Infrared and ideally, it should also contain DNA repair enzymes. In addition, one can take oral protection such as Heliocare Fernblock® capsules or Lamelle Ovelle D3 both of which offer additional protection. Posted in NEWS / Anti-Ageing on September 6th, 2018.